When a singer knows upwards of 250 folk songs, you might reasonably expect his or her repertoire to include certain classic ballads – say, ‘The Wraggle Taggle Gypsies’, ‘Banks of Green Willow’, ‘The Unquiet Grave’ and ‘Georgie’. All widely sung on the folk scene, and widely encountered in British and American tradition. Well this time last year, I didn’t have any of those songs in my repertoire. With ‘Banks of Green Willow’ the problem has been – and continues to be – deciding exactly which of the many fine collected versions to learn. I do have a version of ‘The Wraggle Taggle Gypsies’ lined up to learn – indeed last January I was confidently saying that it would be the next song I learned. It wasn’t, and I’m wary of making any promises about quite when I might knuckle down and get it under my belt. But in the spring I did at least put together a version of ‘Georgie’ and have been singing it often enough since then to begin feeling at home with the song. 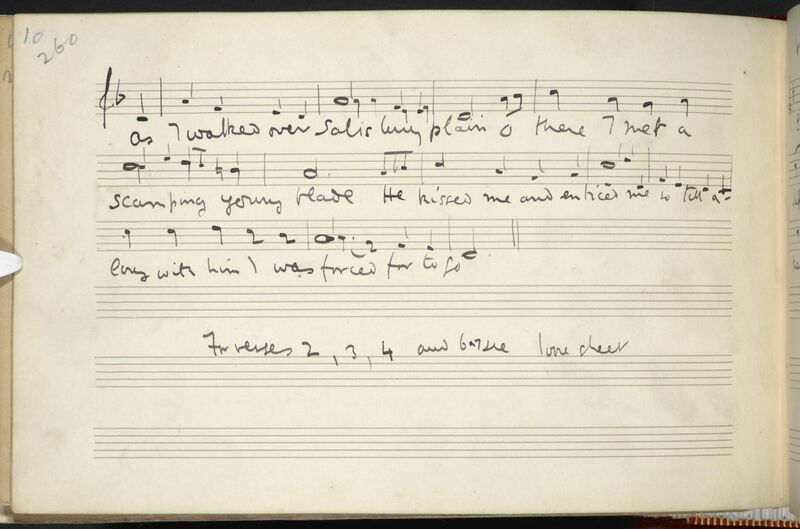 I found the melody some twenty years ago when scrolling through the copies of Vaughan Williams’ MSS held in the library named in his honour. In those days, these copies were available only on microfilm, whereas now, of course, you can get them all online. I was looking for songs RVW had collected in Kent – specifically those he noted from Mr and Mrs Truell of Gravesend. This song is the next one in the MS.
There’s a lack of clarity about its provenance. 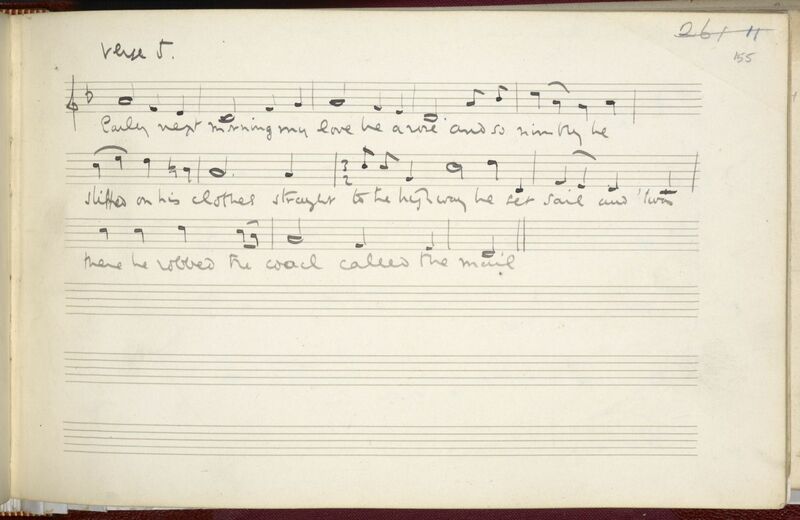 The page is headed “Kent Songs” but the source of the song is given as a Mr Jeffries, at Mitcham Fair (in Surrey). In the VWML index record the Place collected reads “England : Surrey : Mitcham CHECK” so clearly some doubt remains. I suppose Mr Jeffries may have been attending the annual fair, but have hailed from Kent. With no other information recorded about the singer, I guess we will never know. Typically, also, I can’t quite decipher Rafe’s handwriting. 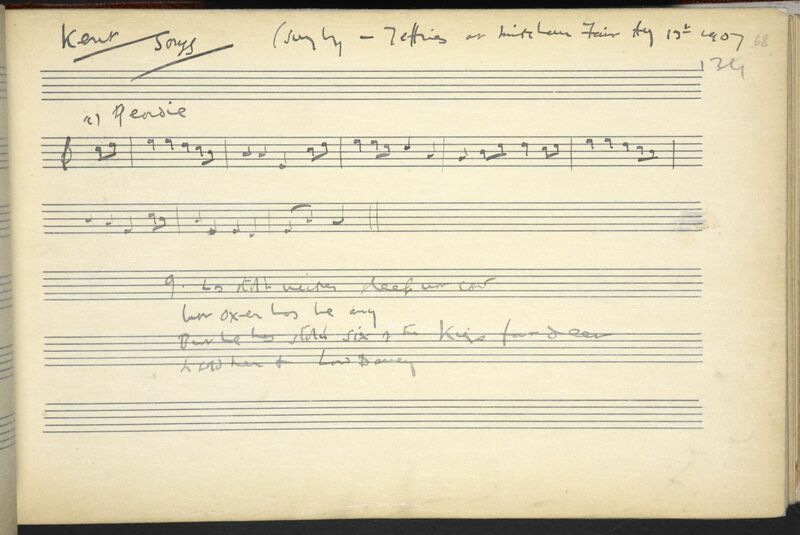 Geordie, collected by Ralph Vaughan Williams from a Mr. Jeffries, 13 Aug 1907. From the Full English archive. The first two verses – including the placing of the action on “a Whitsun Monday” and the “pretty little boy” line – come from a broadside printed by Armstrong in Liverpool in the 1820s. Most of the other verses come from a Such ballad, from later in the nineteenth century, or the version collected by Henry Hammond from Sergeant Fudge, at East Combe Lydeard in Somerset. The “lawyers, lawyers” verse meanwhile is based on an American version, collected by Vance Randolph from Georgia Dunaway, Fayetteville, Arkansas, in 1942. You’ll find historical background to the ballad on Mudcat and the Mainly Norfolk site. Basically, there are two similar but distinct ballads: the Scottish ‘Geordie’, where the hero’s wife successfully saves him from the gallows, and the English ‘Georgie’ (or ‘Geordie’), where her efforts are in vain. The songs may or may not have been based on actual historical incidents. But, as with Shakespeare, it doesn’t really matter. Either way, the love and grief felt by the female protagonist are real enough. Death of Georgy, printed by Armstrong of Liverpool between 1820 and 1824. From Broadside Ballads Online. Song number 8 in Classic English Folk Songs, formerly the Penguin Book of English Folk Songs, and few would argue that this is a classic of the genre. It’s actually a song which I’ve almost certainly never sung in public, and which I’ve never really considered to be part of my repertoire. Partly because I’ve always planned to learn Tom Willett’s magnificent version (and having got this version of my chest, so to speak, maybe I finally will), but also because it’s just one of those songs which everyone knows. Still, I seem to know the words without having to think about them, and it is a classic, and it’s a great song to sing; so it seemed daft not to post a version here. I would have first heard it as the opening track of Steeleye Span’s Please to see the King. Where – like a lot of songs on the two Carthy / Hutchings Steeleye LPs – it’s given a wonderfully sparse, austere, atmospheric and totally effective arrangement. Shortly after hearing that recording I would have heard the OK but far less interesting arrangement on the first Steeleye LP, and then Andy Irvine’s take on the song, on the debut Planxty album. I suspect most of the words went in by osmosis, but having them in the Penguin book would have helped – no need to transcribe them from tape or vinyl. Vaughan Williams noted the tune, but no words, from Mrs Ellen Powell, at Westhope, near Weobley in Herefordshire. Malcolm Douglas, in his additional notes for Classic English Folk Songs, suggests that Vaughan Williams and Bert Lloyd used Peter Verrall’s version, or possibly the Such broadside shown below, as the basis of the verses given in the book. The blacksmith: broadside printed by H. Such, between 1863 and 1885. From the Bodleian collection. As the broadside versions mention Napoleon Bonaparte’s death, this ballad must date from sometime after 1821. 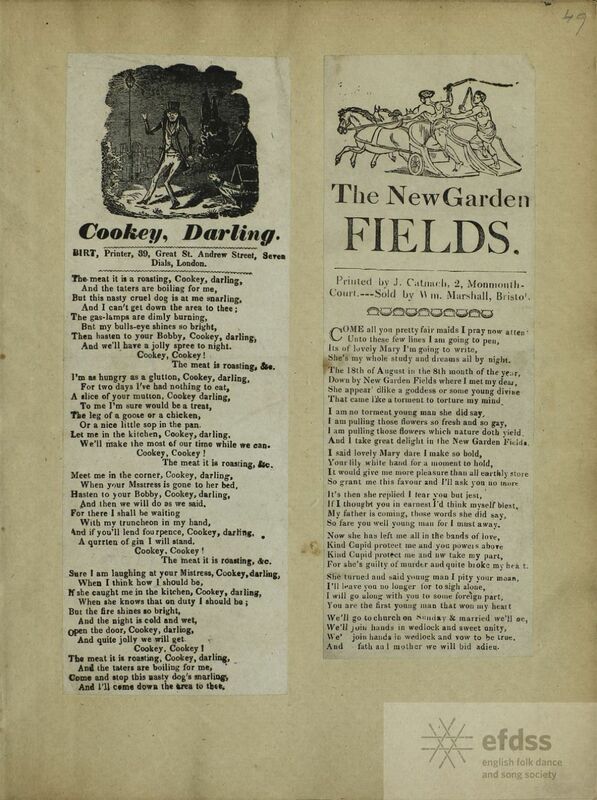 Both Harkness of Preston and Such of London published the song in about 1840 but it was probably based on an earlier broadside ballad called The Grand Conversation under the Rose. Perhaps due to the popularity of the Napoleon ballad, they both, some time later published The Grand Conversation on Nelson. 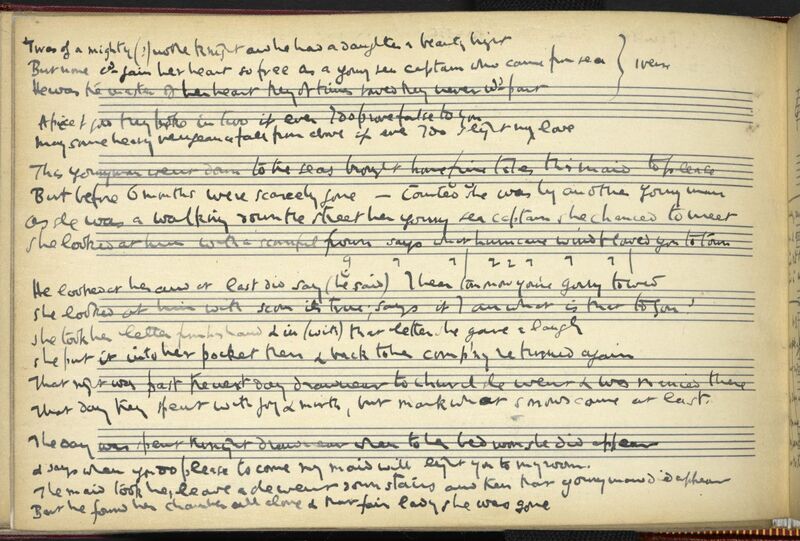 The Grand Conversation on Napoleon Arose – broadside from Ralph Vaughan Williams Manuscript Collection, via the Full English. 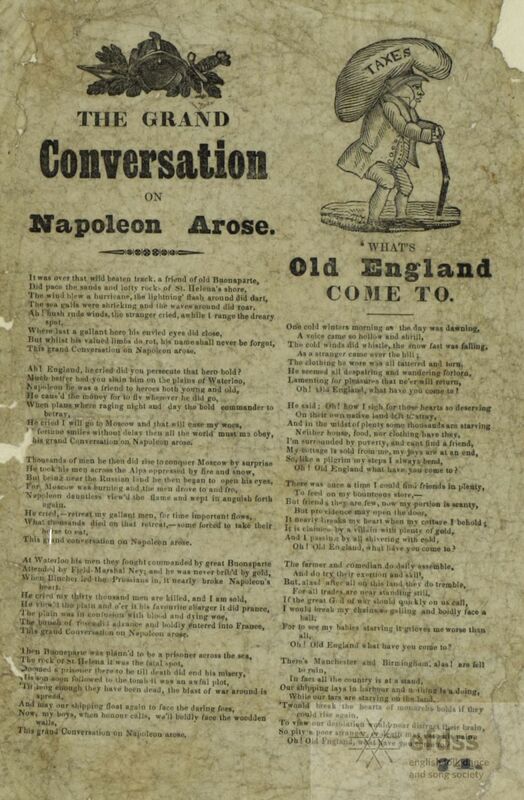 There’s an interesting article on this, and other pro-Napoleon ballads, on the Musical Traditions site –The Grand Conversation: Napoleon and British Popular Balladry, by the always-readable Vic Gammon. Well there we are then: two hundred consecutive weeks of songs on this blog. When I started I guessed that I knew about 150 songs. A little while ago I revised my estimate up to 200, and now I’m thinking the total might be nearer 250. In fact the number keeps increasing: next week’s song (yet more Napoleon) is a song I’ve only learned in the last few weeks. To those of you who have followed this blog over the years, and made supportive or constructive comments, many many thanks – it has meant a lot to me. 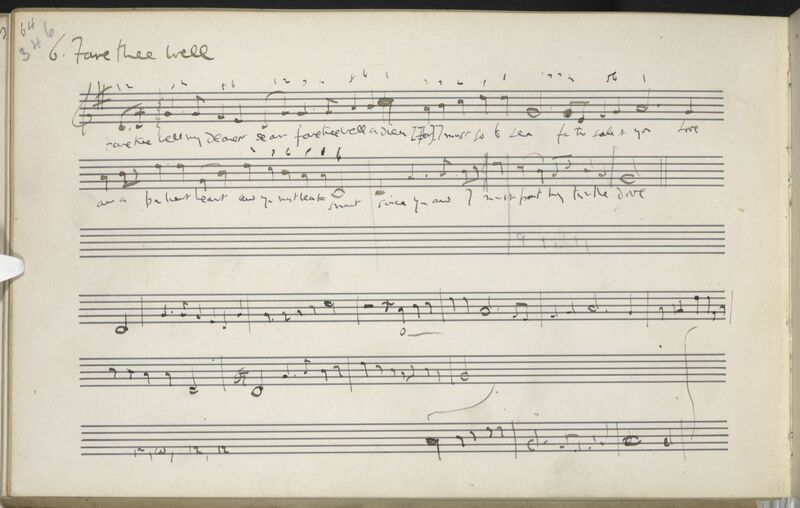 In recent years an incredible number of 18th and 19th century musicians’ tunebooks have become available, either in printed form or on the internet. This is excellent news, of course. But, faced with yet another collection, containing dozens or even hundreds of tunes, and clearly not having the time (or patience) to play through them all, spotting tunes which are worth playing can be a bit of a hit and miss affair. So, more often than not, my initial trawl through a new physical or virtual tunebook will involve looking for tunes with interesting or unusual titles: ‘Pup in the Parachute’, ‘Love laughs at Locksmiths’, ‘Pass around the Jorum’, ‘Peas on a Trencher’, ‘The Fly-Flappers’. Frankly, it’s probably as good an approach as any other. Hurricane Wind. 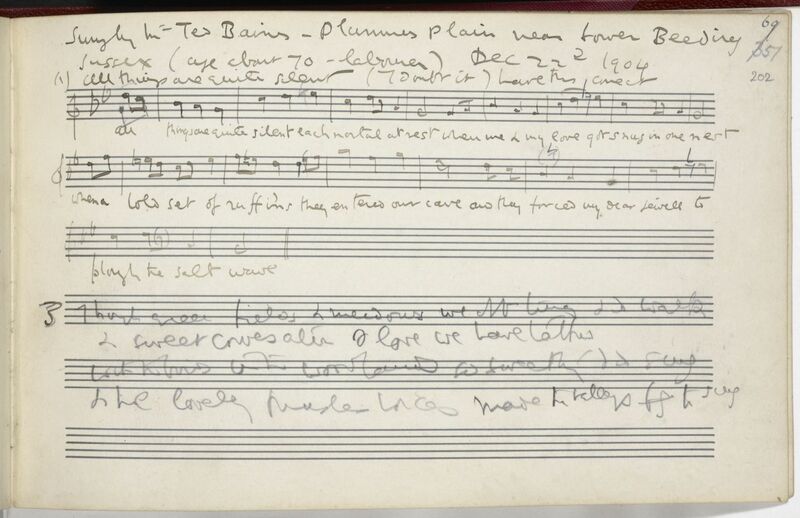 From Ralph Vaughan Williams’ notebook, via the Full English. Vaughan Williams collected the song in 1907 from Mr Penfold, landlord of the Plough Inn at Rusper in Sussex (who, incidentally, was also the source of the rather lovely ‘Turtle Dove’ which Sophie sings with Magpie Lane). Mr Penfold’s text was fairly complete – Roy Palmer added just one couplet from a Scottish chapbook, ‘The Perjured Maid’. However – unusually, as Roy always presented singable versions in his song books – I felt that the song didn’t quite tell the whole story. So, on a trip to VWML, I looked for alternative versions. There weren’t many to be found – at least not in those pre-computerised days – but I located some usable verses collected in 1939 by Alan Lomax and Helen Hartness Flanders from Josiah S. Kennison of Townshend, Virginia, and printed in The New Green Mountain Songster. Hopefully you won’t spot the join. While the Roud Index lists only one English and one Scottish version, this song has in fact turned up a number of times in the United States. I particularly like the way the original “Nobleman near Exeter” has become “The Rich Man Extra Tire” in this version collected from Miss Laura Harmon, Cade’s Cove, Blount County, Tennessee, in 1928. Having pieced together my version in the mid 1980s I then neglected the song for many years, but have recently resurrected it, and was able to give it an outing a few weeks ago when I went to see Elizabeth LaPrelle and Anna Roberts-Gevalt at the Musical Traditions club in London. ‘Two Old Songs- The Perjured Maid, The Waukrife Mammy’ – chapbook printed in Falkirk, c1840. From the G. Ross Roy Collection of Burnsiana and Scottish Literature, University of South Carolina. Posting the song here gives me the opportunity, belatedly, to pay tribute to Roy Palmer, who died in February of this year. It would be hard to overestimate the influence Roy’s work had, over the last 45 years, on the repertoire of British folk singers. Certainly my repertoire, and that of Magpie Lane, would be considerably poorer without books such as A Touch on the Times, Songs of the Midlands, The Rambling Soldier and, of course, his RVW collection. We were honoured and thrilled when Magpie Lane were asked in 2000 to record a CD as a companion to Roy’s book A Taste of Ale. I don’t know if Roy later embraced the digital age, but at that time, when he sent me a draft copy of the book for us to start work on, all the musical transcriptions were done by hand, and the text was all typewritten, on a proper old-fashioned typewriter. In the tributes which poured out following Roy’s death, common themes were praise for his scholarship, for his ability to present folk music and folklore in an accessible way, and that he was a lovely human being and a real gentleman. I only met Roy on a few occasions, but that was certainly my impression. He will be greatly missed. You will find obituaries of Roy on the Guardian and Morning Star websites. Roy Palmer. Photograph by Derek Schofield, from the Guardian. Last Christmas I was taken to task for failing to mention, when I wrote about ‘This is the truth sent from above’, the version collected, and subsequently arranged for choir, by Ralph Vaughan Williams. That version, noted from a Mr Jenkins at King’s Pyon in Herefordshire, has, I have to admit, a rather wonderful melody. But actually variants of the same melody seem to have been used elsewhere in the Welsh border counties for other carol texts. I have a four-part arrangement which I hope to post some time of a version of ‘On Christmas Night All Christians Sing’, collected in Shropshire by Cecil Sharp, and which is clearly a variant of Mr Jenkins’ tune. 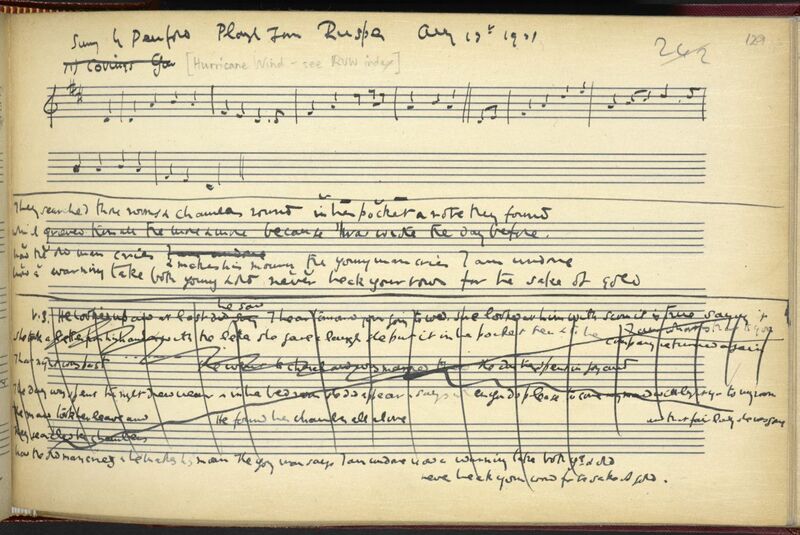 And here’s another variant, once again from Herefordshire, recorded in 1909 by Vaughan Williams and E.M. Leather from Mr W. Hancock (or Hancocks) at Weobley. It is a great favourite with Herefordshire singers, and was formerly sung at Christmas, although the subject is clearly the Crucifixion and not the Nativity. 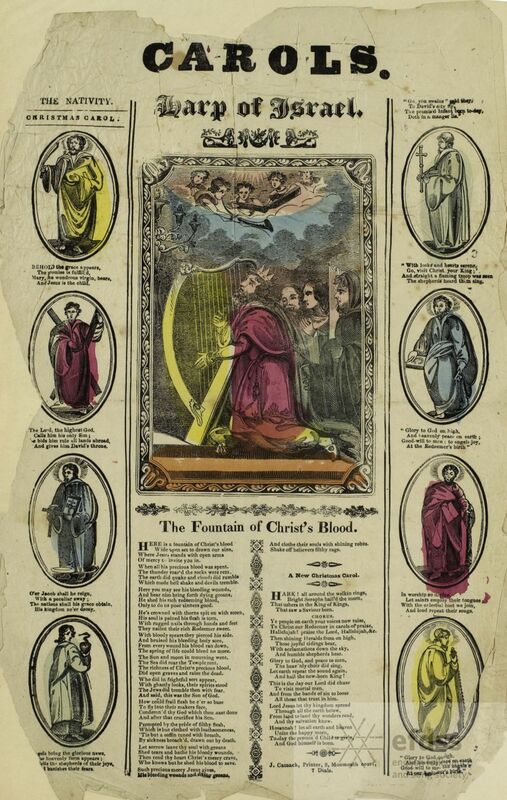 The Fountain Of Christ’s Blood, from the Lucy Broadwood Manuscript Collection, via the Full English archive. Having learned and recorded ‘Jack Williams’ a couple of months ago, this was to have been my second new song of 2014. So far, however, all attempts to din the words into my head have proved fruitless. I have occasionally, when recording songs for this blog, had the words in front of me as a safety net; this is the first time they’ve been an essential prop. I wanted to put the song online now though, as it’s appropriate for Easter, and I’m not sure that I have enough songs to keep this blog going till Easter next year! Oh, there I met a scamping young blade. Till along with him I was forced for to go. Clearly you could interpret the word “forced” to mean that the narrator was subject to physical coercion. But the way I read the song, she was just swept off her feet, and ultimately found the scamping young blade irresistible. And the last verse – especially the slightly oblique last line – is, well, classic. And you will die upon the high drop at last. Well it’s good to have the full facts available, and it would appear that it’s fairly easy to determine the extent of Bert Lloyd’s intervention here – which is sadly not the case with many of the other songs he introduced to the folk scene (‘Reynardine’, ‘Weaver and the Factory Maid’, ‘Recruited Collier’ and ‘Lucy Wan’ spring to mind). And while one can regret that Lloyd was often less than transparent when he “improved” a traditional song, it’s hard to fault his artistic judgement – in most cases it seems he really did improve on the originals. There’s nothing wrong with Henry Burstow’s final verse, but I have no hesitation in saying this song is more effective without it. Incidentally, I first heard this song sung unaccompanied by Martin Carthy on the LP Prince Heathen, and I’d rate it as one of the finest performances of Martin’s recording career. Salisbury Plain, collected by Vaughan Williams from Mr and Mrs Verrall. Image copyright EFDSS. Salisbury Plain, verse 5, collected by Vaughan Williams from Mr and Mrs Verrall. Image copyright EFDSS. I first heard this song on the album Amaranth. This was the 1970s reissue of Shirley and Dolly Collins’ Anthems in Eden suite, where the suite itself was paired with new recordings featuring what one might loosely describe as the Albion Dance Band. The arrangement on this track was greatly enhanced by the presence of a sackbut quartet (for 10 points: which other Albion track from the early seventies featured four sackbuts?). I actually learned the song from the Penguin Book of English Folk Songs where I found that, as taken down by Ralph Vaughan Williams from Harriett Verrall in 1904, the song had a rather more unpredictable rhythm than when rendered by Ashley and the boys. I think I was always aware that I hadn’t quite learned it “right”. Checking back now with the book I can see that my interpretation of the tune owes at least as much to the way Shirley sings it, as to the way it was collected from Mrs Verrall. 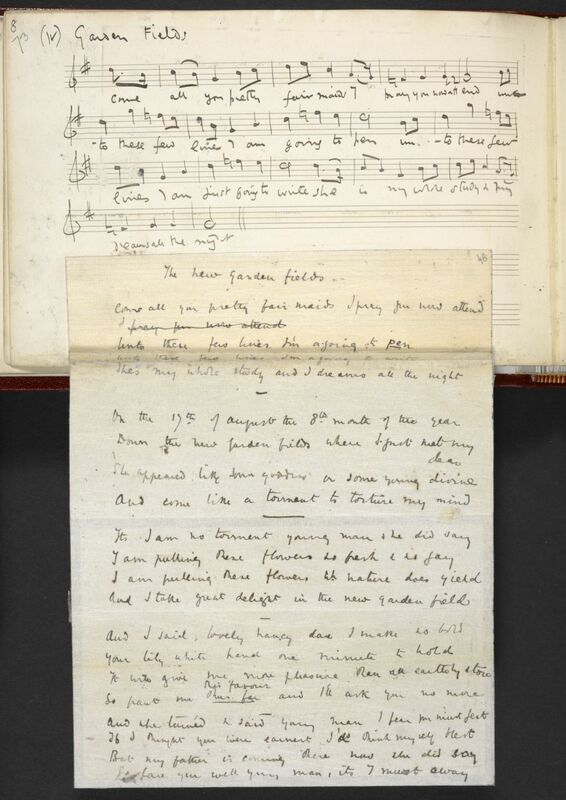 Incidentally, I can only find Mrs Verrall’s tune and first verse in the Full English archive, although six verses are given by RVW in the 1906 Journal of the Folk-Song Society. Fare thee well my dearest dear, noted by Vaughan Williams from Harriett Verrall, Horsham, Sussex, 22 Dec 1904; image copyright EFDSS. The two faithful lovers. Broadside printed in London, between 1663 and 1674, from the Douce Ballads. Image copyright the Bodleian Library.